I know, you think I’m crazy. 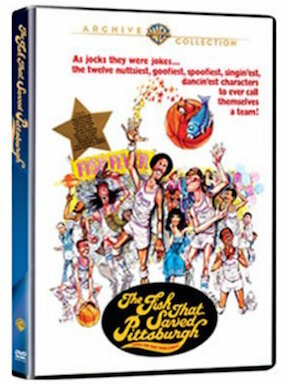 The Fish That Saved Pittsburgh is the greatest basketball movie ever? Are you serious? The one with the hokey characters and the poor productions values? Are you on drugs bro? No I’m not, I’m of sound mind and even sounder body and I’m gonna show you just why I stand behind my proclamation that The Fish That Saved Pittsburgh IS, without question, the BEST BASKETBALL MOVIE OF ALL TIME!!! The Music, you Jive Turkeys – I challenge any of you to watch this movie, listen to the fabulous music by groups such as the Spinners, the Sylvers and others,and not get juiced. For me personally, when I see the scene in that first game when the team is playing together for the first time, and the theme song comes on by Bell & James, I get chills every time. EVERY SINGLE TIME!!! I challenge you not to feel the same. The One and ONLY Dr. J – I’ve said it before and I’ll say it again. You suckers have not seen the real Dr. J unless you saw him in the much-missed REAL ABA (not the current joke version that is a disgrace to the memory of the real ABA). The original ABA was NOT a minor league basketball league. The only thing it had in common with the current abomination is some of the owners were ill-prepared to run teams, just like 99% of the teams in minor league basketball today. No money. But talent-wise, it was a real threat to the NBA and no one exemplified that better, and was the primary reason the NBA wanted a merger, than the incredible Julius Erving, my favorite player of all time, the Doctor. When the merger happened, the Nets were forced to sell the Doctor to the 76ers to cope with the hateful merger fee and other nonsense fees the NBA put on them. The Doctor joined a team of all-stars and, as unselfish as he was, toned down his game for them. Until they needed them, like in the final against Portland. Or in the All Star game when he showed what’s what. But even then, his knees were shot, you still didn’t see the real Doc. That’s right! The Doctor, who made that reverse layup against one of the NBA’s greatest players ever, the giant Kareem Abdul Jabbar, was not at his peak. Like he was in the ABA and I had the good fortune to see him play for my beloved Nets. the REAL Nets! So if you want a taste of what he was like,watch this movie. Moses Guthrie is ABA Dr. J. The Team Concept – TEAM, are you sh!tt!ng me? Have you seen movies like Hoosiers? I’ll get to that overrated movie later, but yes TEAM. Let me explain. The whole movie is predicated on chemistry. That talent alone is not enough, you need to mesh together. So they got rid of the entire team but Moses, bonafide “league” players. And held an open tryout for Pisces people to be the new team. And so they get the most motley group of players the world has seen and wouldn’t you know it, they gell because DESPITE their differences, they work great together. CHEMISTRY made a star, a short slow white carnival trick-shot artist, an angry muslim, a preacher, an indian, a former white college star who is a space cadet, a dj, identical twins, and on and on come together united in purpose. And love each other. Don’t believe me? 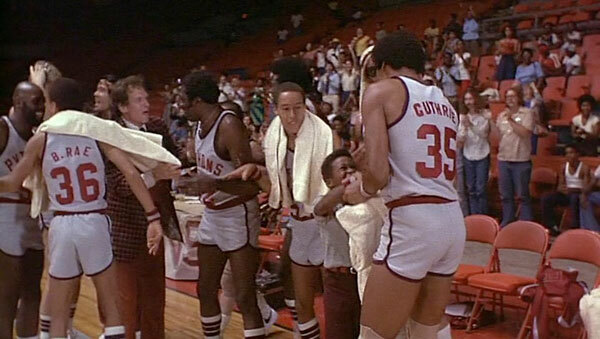 Watch the scene where the beat-up Setshot is being helped to the free throw line by who? That previously mentioned muslim, The Truth! Beautiful man, simply beautiful! The Players – As I mentioned in the previous point, the players are just frikkin awesome! CLICK HERE for more details on the players but again, how could you not love the kind of guys this team is composed o? The Children – Perhaps the most important message the movie presents is, the children matter most. Something the pro leagues of today seem to forget, though they make superficial claims otherwise. Whether it’s listening to the super-wise beyond his years ballboy, Tyrone and his HUGE dreams, or an owner that never forgot to stay a child on the inside, sports is supposed to be for the kid in all of us. FUN, laughter and even balloons. The Owner – H.S. Tilson is the owner all sports team should have. Sweet, child-like, always focusing on fun, and willing to listen to anyone. Money topics bore him, he’d rather give everyone a balloon. He just wants everyone to laugh and be silly and enjoy the game. He also NEVER interferes with the coaches or players, letting them do their job. The Coach and Trainer – Sometimes the best thing a coach can do is give support to his players, be positive, and stay out of the way. Unlike coach-centered movies, it’s all about the players and coach knows it. And Harry the trainer is the kind of guy that the corporatey NBA just doesn’t have use for anymore. Cigarette in his mouth, suffering no fools, and he’ll help anyone despite his gruff exterior. What It’s Not – You can keep your yawn inducing, extremely overrated trash like Hoosiers, a movie that over-controlling coaches want to marry and have babies with. That movie is BORING, something the Fish is not!!! It and others of it’s kind are ALWAYS about the coaches and the players are secondary, again something the fish is not! This movie is all about how much FUN playing basketball is and how great it is when you just have fun playing together with your friends. That’s it, that’s what it is. No pretentious nonsense, no patronizing wise coaches teaching dem poor black folk. No, this is all about you and your boys! The Basketball – Oh the glorious slam dunks by the Doc, the brilliance of Meadowlark Lemon and his high post passing, it’s just so much fun to watch. Oh crap, there’s that word again, fun. Production Values – We end where we started, the much-maligned poor production values. Not a weakness but a strength and part of what makes this movie so awesome. From the fact that they couldn’t say NBA and had to call it “the league”, to the stock-footage of the cheering crowds interspersed with real life shots of empty seats because I assume they couldn’t afford the extras. Makes no sense, how it could be both full and empty at the same time. But I love it. What they lacked in production excellence, they made up for it in spirit. And that’s the fact jack! The plot is simple and beautiful and encompasses everything that makes basketball great, CHEMISTRY! The Fish That Saved Pittsburgh tells the story of a struggling professional basketball team, the Pittsburgh Pythons, whose continuous losing streak and lack of talent has made them the laughing stock of Pittsburgh. Several players ask to be transferred to other teams, partly due to the bad publicity and the presence of the difficult but highly paid star player, Moses Guthrie (Julius Erving). Believing that the team needs a miracle, ballboy/waterboy Tyrone Millman (James Bond III) turns to astrology to improve the team’s fortunes. He brings his idea to astrologer Mona Mondieu (Stockard Channing), and they come up with the perfect concept: a team composed entirely of players born under the astrological sign of Pisces, the star sign of Moses Guthrie. The team is reborn as the “Pittsburgh Pisces”. Although Moses and Tyrone’s sister (Margaret Avery) think that Tyrone’s idea is absurd, they ultimately embrace the concept. The plan succeeds wildly due to the new team’s eccentric skills, teamwork, and Mona’s astrological readings, culminating in a championship opportunity. The Fish That Saved Pittsburgh is an American sports/fantasy comedy film that was released in 1979. The movie was directed by Gilbert Moses and co-produced by David Dashev and Gary Stromberg. It was produced by Lorimar and distributed by United Artists. 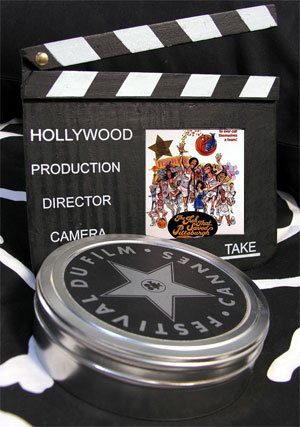 The rights to the film are currently owned by Warner Bros. through its 1989 acquisition of Lorimar. It was filmed on location in Pittsburgh and at Pittsburgh’sCivic Arena as well as suburban Moon Township, Pennsylvania. The movie has attracted a cult following, most notably for its disco-inspired setting and soundtrack, as well as the appearances of many NBA stars (including lead actorJulius Erving) and early roles for Debbie Allen, Stockard Channing and Harry Shearer. The film also has a cameo by long time Pittsburgh Mayor Richard Caliguiri as himself, hosting the fictional team at a rally and shaking hands with Erving.